Dune II: The Building of a Dynasty (also known as Dune II: Battle for Arrakis in Europe and Dune: The Battle for Arrakis in the Sega Genesis port) is the second game in the Dune series, released in 1992 by Westwood Studios. It is a loose sequel to Dune (although it shares no storyline or gameplay). While not the first real-time strategy (RTS) game (both Ancient Art of War and Stonkers preceded it), Dune II established a format that would be followed for years to come, and is the first to use the mouse to move units, giving much fluid interaction . As such, Dune II is the founder of the RTS genre in its modern form. Striking a balance between complexity and innovation, it was a huge success and laid the foundation for the coming Command & Conquer (which was nicknamed "Dune III" by some fans and detractors), the Warcraft series, and many other RTS games. Emperor Frederick IV of House Corrino is desperate for the harvesting of the valuable spice melange, only found on the planet Arrakis, to pay off all of his debt incurred on internecine wars with family members. To achieve this, he now offers the sole governorship of Arrakis to the House (huge nobleman family/cartel) which delivers the most spice for him out of House Atreides, Harkonnen and Ordos. War begins as deputations from all three Houses arrive on Arrakis. The player is a military commander from a House of their choice. In the first few missions the objective is to successfully establish a base on an unoccupied territory of Arrakis, to harvest spice and defend against intruders. Later, when the three Houses divide Arrakis among them, the player has to assault and capture enemy territories. When the player dominates Arrakis on the world map, the two other enemy factions ally against their common enemy. The ultimate final showdown is the battle among the player's House up against three enemy sides, among them Frederick's forces the Sardaukar (an unplayable elite force whose heavy infantry are particularly powerful). The final cutscene is different for each House, in consonance with their very disparate worldviews. The player takes the role of a commander of one of three interplanetary houses, the Atreides, the Harkonnen or the Ordos, with the objective of wresting control of Arrakis from the two other houses. The basic strategy in the game is to harvest spice from the treacherous sand dunes using a harvester vehicle, convert the spice into credits via a refinery and to build military units with these acquired credits in order to fend off and destroy the enemy. The game map initially starts with a fog of war covering all area which is not covered by the player's units range of view. As the units explore the map, the darkness is removed. Unlike later games such as Warcraft II: Tides of Darkness, the fog of war is lifted forever with initial exploration, it does not become dark once more when units leave the area. In addition to enemy incursions, there are other dangers; like the marauding and gigantic sandworm, capable of swallowing vehicles and infantry whole but only capable of moving through sand. The player can only build on rocky terrain, but must build concrete foundations before to avoid deterioration of the structures due to the harsh weather conditions although in general, structures will gradually decay over time regardless of the presence of those concrete slabs due to the aforesaid weather conditions. Spice fields are indicated by orange coloration on the sand, darker orange indicating high concentration. Some spice may be concealed as bumps on the terrain (a 'pre-spice mass') that become spice fields when they are shot at, or when a unit runs over them (the unit is destroyed in the ensuing 'spice blow'). The player is presented a map of the planet Arrakis before most missions, where he can choose the next territory to play in among two or three. This affects primarily the enemy house fought in the next mission, as all missions except the first two require the complete destruction of the enemy. Nine territories must be fought, irrespective of house, to reach the endgame. The Dune II interface is the basis for subsequent real-time strategy games, being the first to use the mouse for unit control, but is inconvenient when compared, for example, to Command & Conquer. Dune II did not have unit grouping or context sensitive cursors, as they were not used in RTS games until C&C and Warcraft II: Tides of Darkness, and, unlike later games, clicking on a piece of land or enemy will not result in movement or attack actions. To do so requires clicking on the "Move" or "Attack" buttons (or pressing of a hotkey), and then selecting the target. It will only attack the side of the player's base facing its base. Also, it targets a player's building and will continually attack that target until it is destroyed. The AI targets the player's repair center, palace, starport, and unit producing structures with high priority. It is generally incapable of flanking or ambush maneuvers. Only earlier versions of the game featured few ambushes, but they were preprogrammed on the level's shape and not planned by the AI. It sends attacking units as soon as they are built from their base instead of assembling an attack force. It does not build additional defenses once initial base construction is concluded although the AI will replace destroyed base defenses as its priority. It will attack its own buildings in an attempt to get to your units which are within sight and firing range. It relies on several cheats, such as infinite credits, the ability to build unconnected buildings, and, on the 1.0 version, the ability to build structures on top of your units (which destroys those units in the process). If you surround its buildings with walls it will not try to destroy them and will get trapped. If you attack an enemy harvester with an infantry unit and let it retaliate (by squashing it), it'll remain stopped and halt their spice production. If you select a deviated unit and click on attack, then wait until the deviator effect wears off, you can tell a then-enemy unit to attack anything without finding opposition. Dune II was originally released 1992 for MS-DOS. It was one of the first games to support Roland Sound Canvas, and one of the first to play digital samples over a Soundblaster card. Unfortunately it did not support two sound devices, so the player only had the choice between digitized speech (which is helpful in gameplay, since approaching enemy units are announced) and better music. In 1993 it was converted to Amiga and Mega Drive/Genesis. Two years later it was also brought to the Archimedes and Risc PC range of RISC OS computers. The Mega Drive/Genesis port has fairly different building and unit graphics, a full-screen menu-less user interface suited for gamepad control, and no savegame support, relying on access codes for accessing each level. Other additions include a music test option and a tutorial that replaces the mentat screen. The Amiga port is nearly identical in interface and gameplay to the PC version, with less detailed graphics and frequent disk swapping—the game fits in 5 disks. Savegames are stored in a specially formatted disk. Dune II is one of the most influential games in the real-time strategy genre. Though not every characteristic was unique, attributes such as fog of war, and the game's model for resource-extraction, base creation, and military micromanagement became several standards upon which the RTS genre is based. Obvious influences of Dune II can be seen in numerous games, particularly in Westwood Studios' own Command & Conquer series. Chris Taylor stated that Dune II and Command & Conquer were a very strong inspiration, motivating him to leave Electronic Arts to create Total Annihilation. 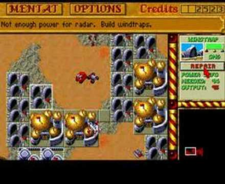 Dune II was given several direct sequels: a Windows remake of this game was published in 1998 as Dune 2000, along with a PlayStation port in the same year. 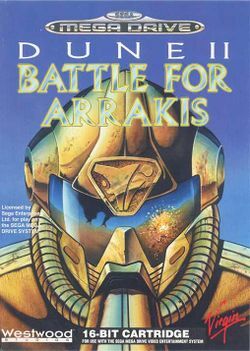 In 2001, Emperor: Battle for Dune was published. ↑ 1.0 1.1 Bob Bates. Game Developer's Market Guide, p. 141, Thomson Course Technology, 2003, ISBN 1592001041. ↑ Brian Schwab.AI Game Engine Programming, p. 107, Charles River Media. ISBN 1584503440. This page was last edited on 18 August 2016, at 01:27. This page has been accessed 30,884 times.